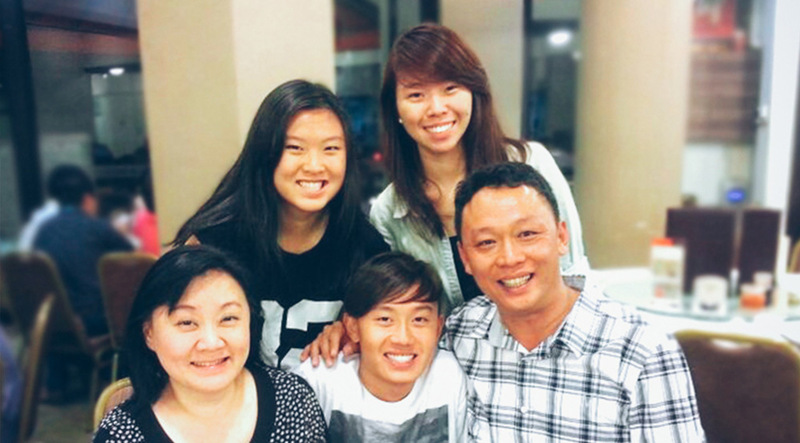 Mark Ong shares his testimony willingly so that people can understand how wonderful it is to know Christ. He firmly believes that knowing Christ will change our lives. I used to be a medium, inviting spirits to possess me. I had a very bad temper, was rash and did things without thinking much. Fighting was a solution. My attitude was to beat the person up first, then allow any explanation later. Some of those I fought with who landed up in hospital too. Speaking vulgarities was a common language to me. I also used to hate Christians. I stereotyped them as “the potato eating group” — the people who speak English, a language I wasn’t good at. I associated them with people who were rich and proud and lived in big houses while I lived in a shophouse. I also thought that Christians prayed to a stick — the Cross. I found no meaning in that. My mum told me that I used to go to Sunday school not for the lessons but to get free biscuits and drink the milo they served. Looking back, those people at Sunday school were very patient with us because we were a naughty bunch, constantly taking their food and disappearing later. I have many friends who only studied till N Levels or below. I hang out with people who are gangsters, people like myself, who often stir up trouble. One day however, I saw a change in one of my friends. He was a Christian. He suggested that I bring my kids to Super Power Kids at St James’ Church on Sunday. He said, “Just check it out, if you don’t like it you don’t have to continue bringing your children there.” Seeing how he had changed to become a better person and that he was a long-time friend, I trusted him and decided to speak to my wife. She agreed that we should give it a shot. So we sent them one Sunday and to my surprise, they wanted to continue going back the next week. We continued sending them to Sunday school but my wife and I did not join the church service like most parents would. We went shopping. One day in 2006, Guan Seng, one of the volunteers at Church, while opening the door for me, asked me which church I was from. I laughed and replied, “It may be better if you ask me which temple I go to.” He suggested that I attend Alpha and passed me the flyer. I asked my friends what Alpha was about. One of them told me it was a shortcut to know Jesus. I always thought I had to read the entire bible to know Jesus. “Now, there’s a short-cut. That would be quite exciting. Perhaps I could give it a try!” I thought. I started attending Alpha at Guan Seng’s home. After each session, there were things I didn’t understand. I’m really blessed to have my wife; she has a university degree while I stopped schooling in my Secondary years. My intelligent wife would help explain to me on the way home and I would continue to reflect and rewrite my thoughts in that green book, the Alpha guest manual. Every week, Guan Seng helped to answer some of my questions and then I would go back to my wife to answer more of my questions. I like Alpha because it is not intimidating, no one will force you to be there every week. But God always made my week go smoothly so that I was able to attend the session every week. Even if I left work early on Tuesdays, there would be no problems that come up at work because of my absence. Traffic on the roads would always be good unlike other days where there were horrible traffic jams. Most of all, I could ask anything I wanted. I remember Uncle Tony, one of the participants, said “let me see Jesus then I will believe” and no one took offence to that. Being able to “Ask anything” was a highlight especially to pre-believers like us. After the course, I did not make the decision to accept Christ yet. I had a dream one day. There was a person standing at the door knocking. I related that person to Jesus, standing and knocking for me to open my heart to him. Strangely, the entire day was filled with more ‘knocks’. I saw a bus advertisement with a hand. When I got to the office, I saw a sign on the door – ‘knock before you come in’. Later when I went to the shipyard, there was a sign was on the office door, — ‘knock before you come in’. These signs were never there before! The dreams and these incidents did not seem like a coincidence. I felt like God was indeed talking to me. I decided to open that door. Together with my wife and my children, we took the next step to receive Christ in our hearts. I told Guan Seng we were ready to sign up for baptism class. Last time, I didn’t like to pray and I didn’t know how to pray. I have learned that when you make that effort to have quiet time with God He answers. Prayer is powerful. Last time, if I did not like anyone it was for a lifetime. Now I pray for people I don’t like and God changes my heart. I am a better person now. I don’t get angry easily or hurl vulgarities at people. My gangster friends couldn’t understand this change in me and some decided to leave me. My good friends started to see the change in me and asked me how I became a Christian. Eventually one of my friends who also used to be a medium took that step and became a Christian. After baptism class I started to help out with Alpha running in the prisons. I see how much people want to change. I wish I had known Christ earlier. I have hurt so many people – I used to kick people in the head like a ball. It was very cruel. If I had become a Christian earlier I would not have been such a person. Now, I share my testimony willingly so that people can understand how wonderful it is for them to know Christ. I firmly believe that knowing Christ will change our lives.